Today I'm up in the Denver area chasing steam, big and small. 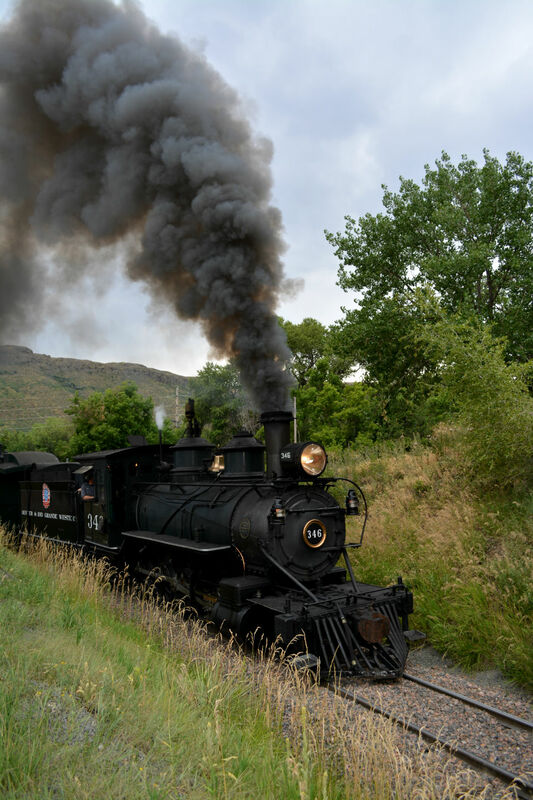 First the 844, then over the Colorado Railroad Museum running steam for the NRHS national convention. It'll be a busy weekend with much more steam photography in the next few days! n of two trains between Chicago and Galesburg, Illinois. It was a disappointing announcement, particularly since this train would have departed from Chicago Union Station. The 765’s operators implicated low ticket sales and a shorter-than-ideal window to market the trip for the cancellation. Critics fired back with an almost unified response: If ticket prices weren’t so high, over a hundred dollars even for a basic coach seat, then more people would have purchased tickets. This is a common criticism of any excursion, not just this one, and admittedly, they have a point. Ticket prices for excursion trains are high, and they do price many people out of riding, especially those who would like to take a whole family along. Where the critics are wrong is in implying that ticket prices are inflated across the board. In most cases, the high ticket prices reflect the very real challenges of operating steam in the twenty first century. This blog post will attempt to illuminate some of the general costs associated with running excursions and break down what, exactly, drives ticket prices up so high. 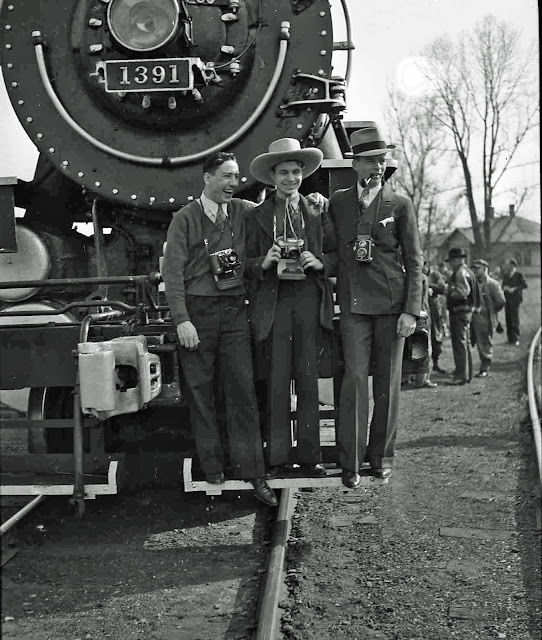 Three rail fans pose during a 1930s photo charter. 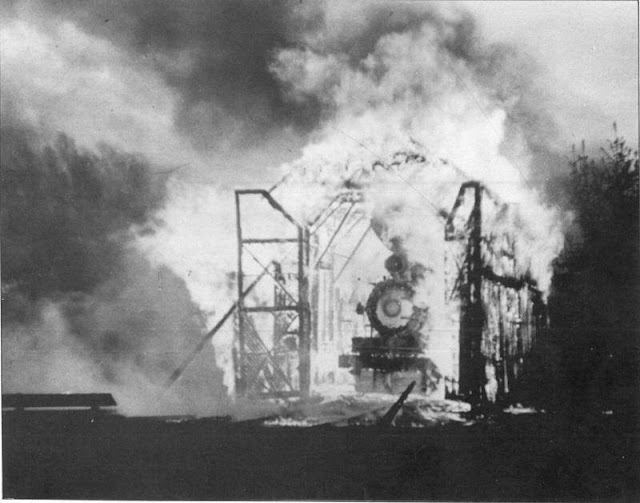 The name of the man who took the first picture of a locomotive or train has been lost to history, and it is unknown whether he made that image for personal pleasure or for commercial reasons. Whoever he was and whatever his purpose, though, he kicked off a hobby that would endure for a century and a half and would create thousands of participants on every continent where railroads operate. In this post, we'll take a brief look at the history of taking pictures of trains. Railroads and photography both have technological ancestors that stretch back roughly to the 17th century, and both began to come of age in the first half 19th century. Railroads in Europe and the United States were built at a frenzied pace between the 1820s and the 1860s and soon composed a network of hundreds of miles in each continent. The new method of transportation revolutionized patterns of work and travel and made it practical to deliver mass-produced goods to markets beyond the immediate vicinity where they were produced. poignant to capture on film. 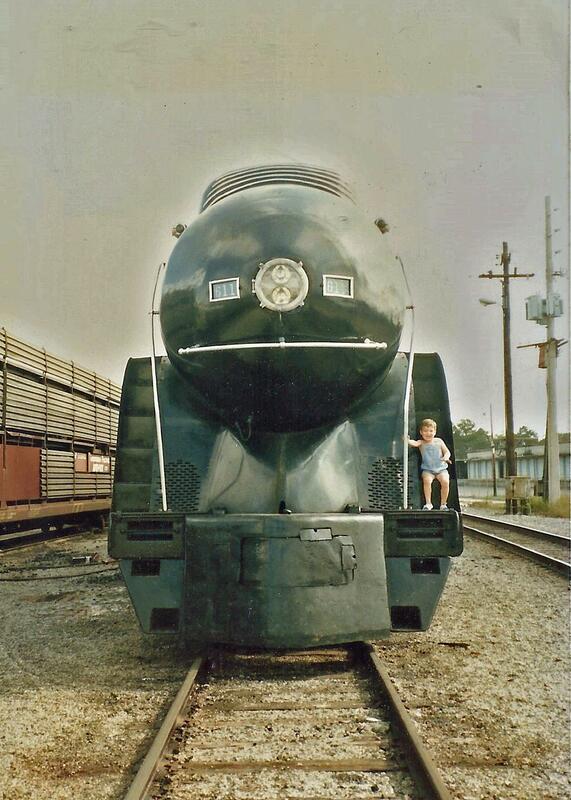 Here, the guest article's author poses with the 611 in the mid 1980s. E/N: Today all eyes are aligned towards Spencer, NC, as the 611 makes its first excursions of the season. In the spirit of that event, enjoy this guest post from John, who's out chasing and riding this weekend. 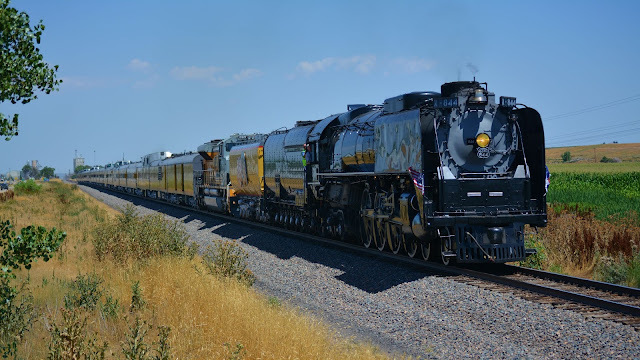 As I write this, I’m sitting at the computer looking up routes to chase the 611 this weekend, contacting friends to meet up with while I’m there, and typing this note about my reflections on steam engines. Next week I’ll drive down to Chattanooga to get the last few steam hours I’ll hold down in the cab before I leave town for the summer. Three weeks from now I’ll start my drive from my home in Tennessee to my railroad job in a Western state. Every time I leave for the summer, the feeling is bittersweet. Tourist railroading divides your time with the cycling on/off months feeling more like a long week. Steam trains only run during bankers hours, ironically. The majority of operations utilize the summer and holiday months exclusively, leaving the rest of the year with an unbalanced void that is only broken by a few limited schedules and special excursions. You might begin to think that the process of boiling water during the winter were not within the realm of physical possibility if you took a statisticians view of the unoccupied schedules. 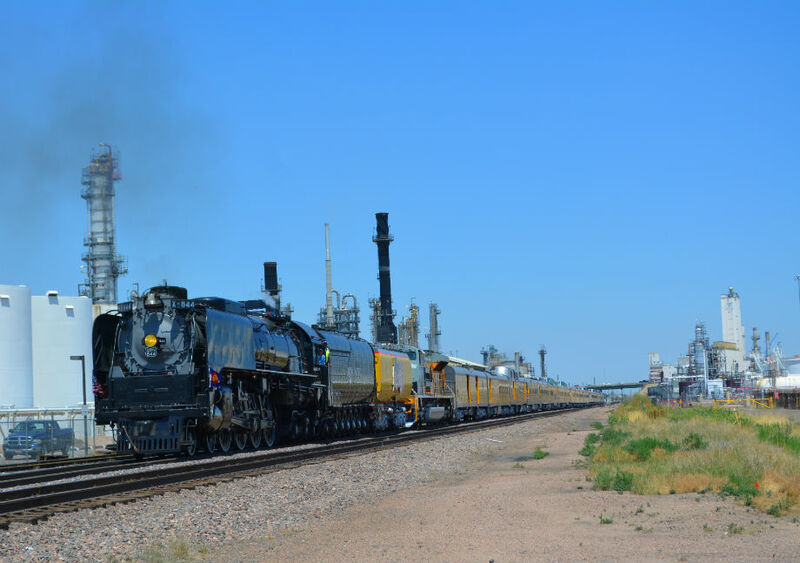 Potential passengers take vacations during the summer, spend January and February recuperating from holiday expenses, while the railroads use the downtime to work heavier repair jobs that consume those boring weeks. When I’m working my summer job, the rest of the world is running wide open with steam miles that I may never have the chance to see. That’s how it goes. I tell my friends all the time, see as many steam excursions as you can while you still have the option. Since the schedule for the 611 was released a couple of months ago, I’ve been elated for the chance to see the thing run before my commitments take me north. My love for steam railroading would not have been created were it not for my dad taking us down to see the 611 regularly when I was younger. The first steam engine I remember seeing? 611. First cab ride? 611. The first engine I was taught the names of parts to the running gear? 611. I’ve worked as an engineer and conductor in some of the most beautiful places on Earth, all because of an interest that started and can be traced back to the 611. As I’ve grown older, I’ve realized that many other people have a similar affinity for the 611 in particular. (To counter that fondness, I still remember the Trains magazine coming out of the mailbox in 1995.) For some, it was their first experience of every human sense being wholly consumed for the first time. Others appreciated the innovative technology the N&W developed for the class, and benchmark it set for the steam industry. The fact remains though, the 611 has been absent of a soul for the last 21 years and there has been a hysteria associated with it's return more-so than any other locomotive I’ve known. I think there is a way that every museum can benefit from that connection. Decisions made about whether or not steam is allowed to run are made solely from tangible money. Time continuously passes with every day leaving fewer favorable conditions for mainline trips. Skill sets fade and the relationship of the landscape formed by the railroad has been lost in translation to the general public. I may be one of the odd ducks of my generation because I found a career that I love when I was young and impressionable, but that doesn’t mean it can be a selfish experience. In fact, the only way to save anything that you love to is to share it with others so that they too want to come and enjoy the shared results. Pulling the throttle and shoveling coal may be the most visible, but every specialty that goes into a steam special is important, from the work of the lawyers writing the insurance policy to the dining service attendants. All of these elements must be orchestrated before that final moment when the engineer bails off the independent and pulls the slack. Every excursion takes years of work and countless skill sets. Looking out the cab window you may see hundreds of people lining up for miles to take in the show. Some may be curiously caught off guard in a wave of sudden traffic or have spent half the night driving in from out-of-state to get what may possibly be their last look at an old way, a way when people worked together and enjoyed the fruit of their labor. That, I believe, is the intangible way to preserve steam. So this weekend, I’m going to take in as much as I can just like everyone else driving to Spencer tomorrow. 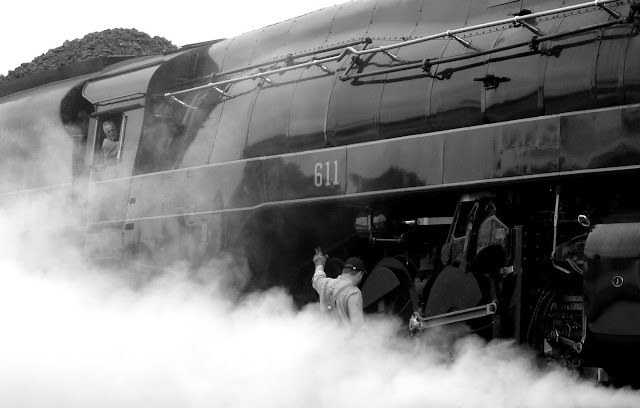 Who knows how much longer we’ll enjoy steam on the mainline? For the most part the engine looks exactly as it did when I was 3 years old. The view looking out from the cab windows may always change but looking in, time has thankfully stood still. This blog has gotten quite a decent amount of mileage out of exploring the way that steam locomotives are portrayed as and sometimes even give the impression that they are alive. It might be tempting to think that this comes about because pop culture proliferates with franchises like Thomas the Tank Engine and the Little Engine that Could which have anthropomorphic locomotives and trains as main characters, but references to steam locomotives seeming to possess a consciousness of their own actually date back almost as far as the railroads themselves. One thing about the nature of personality and consciousness, though, is that just because someone or something is in possession of them does not guarantee it to be a friend and ally. In fact, one of the best benchmarks in deciding if something is conscious may be that it can choose not to comply with what we would like it to do. The superstitions that steam locomotives may be alive do not neglect this unpleasant aspect of consciousness. In fact, an entire mythology grew up to describe it: The Hoodoo Engine. F-O-F has a big announcement--now selling Photo Prints! 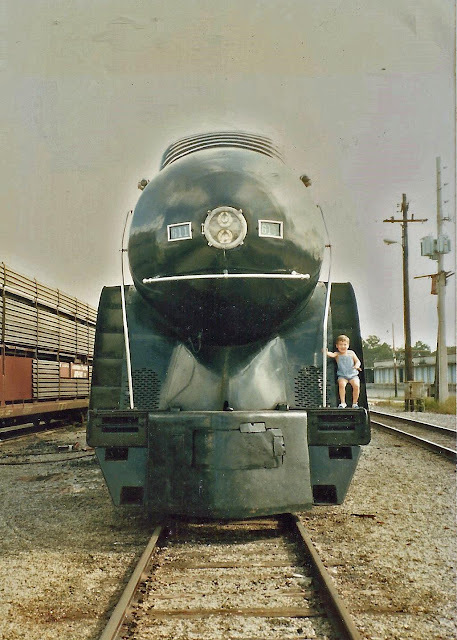 One month ago, I found myself on the roof of the tower overlooking Kansas City Southern's Shreveport Terminal, camera in hand, snatching up photographs of the annual Holiday Express' excursion for the Trains Magazine Newswire. Below me, the staff of volunteers and paid employees were putting the finishing touches on the six display cars, and members of the public were already lining up in the parking lot. The impeccable KCS business train sat a few hundred yards down the line, tucked safely away from curious members of the public. KCS 1 and 2 rested in the distance at the head end, tinged pinkish by encroaching twilight. The Shreveport terminal was the KCS's alternate location for the Holiday Express' stop after a fireworks show evicted it from its normal location closer to downtown. 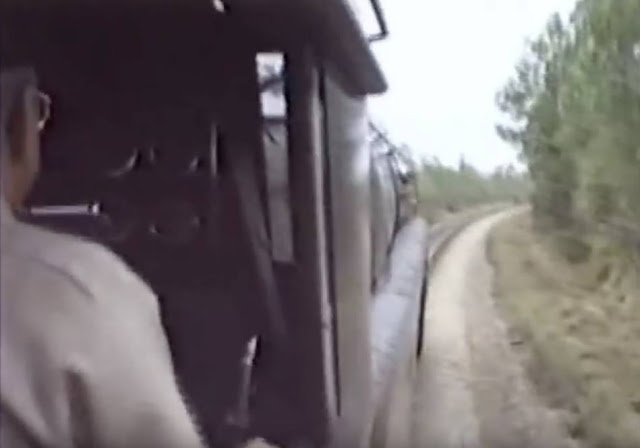 Passing freight trains would occasionally set the ground rumbling with a harsh slack contraction and the remote controlled locomotives constantly shuffled around in the background. The terminal staff and train crew bemoaned that the show was apparently competing for the public's attention and had caused the number of attendees to be somewhat lower compared to the previous year, but the lines seemed to consistently stretch through the parking lot and out to the street.